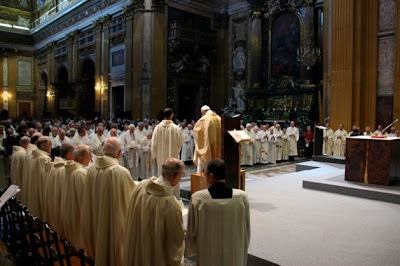 Whispers in the Loggia: "Us Jesuits" – On Ignatius' Day, The Pope Comes "Home"
To mark this feast of his community's founder, St Ignatius of Loyola, earlier today the first Jesuit Pope joined some 200 of his confreres for a celebratory Mass at Rome's Gesu Church, following which Francis prayed at the tombs of Ignatius, his co-founder St Francis Xavier and Father Pedro Arrupe, the legendary General (1965-83) whose vision of faith and justice created the Company's modern understanding of itself. 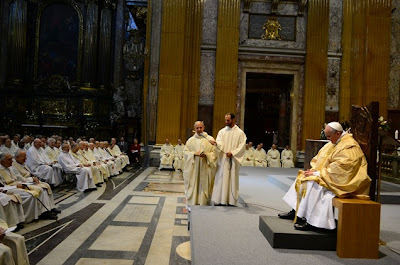 Asked during his in-flight remarks on the way home from Rio how his 55 years in the Society of Jesus impacted his new ministry as bishop of Rome, Francis – shown above embracing Ignatius' 28th successor, Father-General Adolfo Nicolás, on departing today's rites – said in reply that "It's a theological question, because Jesuits make [the fourth vow] of obedience to the Pope [for the service of the missions]. But if the Pope is a Jesuit, maybe he should make his vow of obedience to the General of the Jesuits. "I don't know how to resolve this," the Pope continued. "I feel myself a Jesuit in my spirituality; in the spirituality of The Exercises, the spirituality I have in my heart. But I especially feel this going into the feast of St Ignatius with the Jesuits. "I haven't changed my spirituality, no. Francis, Franciscan: no. I feel myself [as] a Jesuit and I think as a Jesuit." ...and with that, buona festa to all the Jebbies out there, and everyone celebrating along.